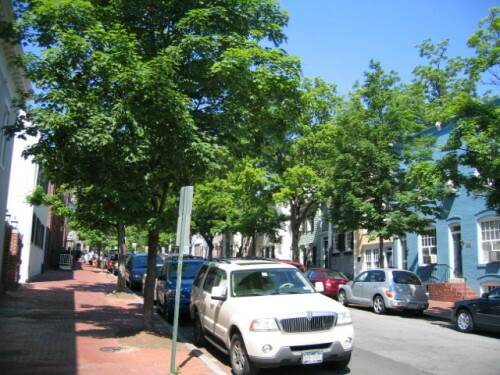 I challenge anyone to name a quainter, cozier�town than Georgetown (which also�has�15-minute access to a city)�- or one in which it is more difficult to park a car. It might be worth it to be a politician just to live there for a while. Georgetown beats Cambridge Mass.�hands down as a place to live. Every city in America which destroyed their 19th century factories, train stations, town houses etc. during the 70s government-funded frenzy for "urban renewal" is crying today. Case in point, as our�Dylanologist keeps reminding us, is Nashville which would be packed with pubs, shops, tourists,�and million-dollar townhouses today if they had not bulldozed the old�downtown to "modernize" it, to sterilize it, and to erase its history along with every human-scale building. So people go to the disgusting�malls, which are, happily, a dying fad. Like Bridgeport and Hartford, CT, the urban renewalist Stalin-inspired and highly-educated planning geniuses removed every reason a person might want to go, or to live, downtown. Only the backwater cities escaped that assault. Lucky for them. The supremely elegant and�lovely Savannah, Georgia is my prime example, but we will do Alexandria, VA in a couple of days - same story but without the aristocratic flavor of Savannah. God bless Jane Jacobs.�I was fortunate to hear her speak once in New York on the subject of Harlem. I call it Urban Renuzit and it breaks my heart. Too many towns and cities with musty old history and edifices get �freshened� with saccharine-scented �Bulldoze and Build Bouquet� smells from city councilmen�s and developers' aerosol bottles. As a clueless teenager during the early 1970's I had no clue how bad the cities were at the time. If it was made today would anyone take the premise of "Escape from NY" even half way seriously. Following on the heels of the Great Society the planners were at a loss to explain the demise of the center city so they hit on two ideas one good and one bad. Together they ended up bad. The first idea was to end "blight". This early example of the broken window theory would have worked if implemented alone. But the second idea was that modern architecture would lure people back in. So they fixed blight with soulless plazas of planning. The real factors were high pre-Reagan taxes, high pre-Guliani crime, and the post Great Society destruction of the black family. The failure of planning has not stopped the planners from trying. They get to try out new ideas and the usual cabal of gov't construction contractors will enable them. har --we both need some "blurbin' renewal"
(Sigh) Guess you're right, at least about me. Will be stopping soon, anyway. It's just that this is a subject near and dear to my heart. Better to buy up some more old property and save it than to blithely blurb and poorly pun about it all, yes? nah, don't quit--the worse a pun is, the better it is. Puns reverse the natural ardor of the universe. Puns do what?? Doesn�t much matter in cyberspace, but in real life will have to bite tongue an awful lot. Re the subject matter- funny how the little old blue-haired Hysterical Society ladies were right all along. Yes, it's true. Alaric the Goth did no worse to Rome than the city planners did to Nashville in the 50s and 60s. scroll down and listen to little bits of Bob Dylan's 1969 "Nashville Skyline". Though I bought it several times, in LP, cassette, and CD, if I want to hear it I have to search the web for snips, because the kids STEAL EVERYTHING by Bob Dylan. Also, everything by everybody else too, except Perry Como and Patti Page. Whoa, pardner . . . you missed the leader in federally-funded urban renewal - New Haven, CT. Yup, they were the first that I've known about. A whole swath of a neighborhood (Oak Street) was dozed, and lay pretty much fallow for almost 40 years - now there are parking lots! The neighborhood where my Dad and Grandfather had their business (State Street) was also "eminent domained". All the merchants and the families who lived upstairs were told to get out, and that also was a barren wasteland for about 25 years. I used to raise a glass in my younger days with someone with the City Planning office, and he told me that they NEVER had a clue. At about the same time in the mid-sixties, New Haven became world famous also for their one day residency requirement for welfare qualification. I had a customer in the late 80's whose wife worked in the City Welfare office, so that was my source for that little tidbit. The ancedotes are heart-breaking. But of course Bridgeport and Hartford suffered, too, and it continues to this day. Charleston, SC. So much more beautiful than Williamsburg, VA and totally authentic. Virginia has a lot of wonderful authentic main-street towns. Richmond's Fan District and now the renovated Church Hill area that was in decay for years...both terrific places. Seems this state is pretty good at planning - or at least not changing history in its efforts to plan the ever burgeoning conurbation from DC. If you ever get off the beaten path in this state and head towards the mountains, you will think you've gone back in time. My little goat took the Patti Page, too. All that�s left here is an overlooked �The Essential Bob,� which at least has Maggie�s Farm and LLL on it, and a Roy Orb that wasn�t in its original case. I�m down to Schumann lieder for my pop listening pleasure. Thanks for the reminder about Nashville Skyline, which is completely wonderful. oh, man, that high note Roy Orb hits on "Crying" --oh, mercy. Since the WWI the army had a thing they called Systems Science. Taking into consideration every aspect that may affect problem and concomittant decision. However, getting that thought process into the schools of planning or architecture took nearly a century. They refused to think of anything except their own ego's "design solution". Now of course that environmentalism has become the only subject to be taught the idea of system inquiry is not strange on campus--but, the idea of building urban planners who would have the courage to ask systemic questions--well that is still very rare, as are urban planners who have the courage to demand that city politicians, and developers move forward with intelligence, integrity, and an agreed upon level of quality that is greater than what was before. Roy Orbison. wow. He's who you put on your record player after you broke up with your boyfriend. Bill Quick (Daily Pundit) had a thread going on which of Dylan's lines was the best 'tell-off' line. What a great thread. I sang my way through it. The funny thing - few could name just one. I agree, but so many of the houses are poky and disfunctional. Appealling place to visit, but expensive and annoying to live in. I used to live near the Van Ness Station in upper NW DC and liked that neighbourhood, with lots of trees, good public transport and nice parks. Not so cramped and it had public transport, which the good folks of Georgetown voted against because it would allow the rif raff to visit too easily.